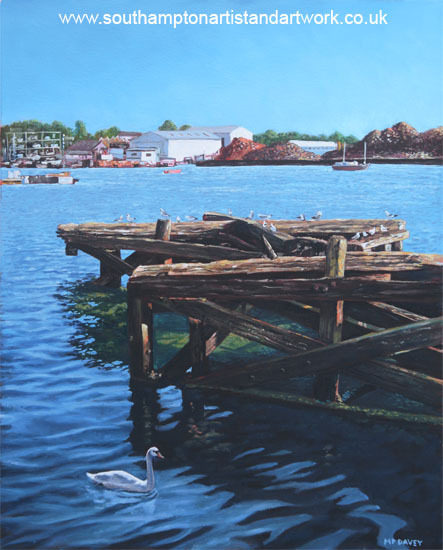 This oil painting is a view of the River Itchen, in the county of Hampshire UK. Here it is seen in the area of Northam, in the City of Southampton heading towards the port. Local business can be seen in the background, including a scrap metal merchant. The metal is piled up in several mounts on the berth, awaiting collection by ship, usually about once a week. In the foreground is an old jetty, now reduced to 'wooden bones'. However the local seagulls use it to enjoy the view and sunshine on this summer evening. A swan in circling around the base of the jetty. The painting is done on a canvas measuring 16" x 20". A bright red acrylic paint base was initially applied to the canvas, followed by a drawing in brown acrylic. A colour wash was then applied, again in thinned acrylic paint. Finally the painting itself is done in oil paint, straight from the tube.